Most straight or comedic actors at one stage have to dive into something other than the funny or nice guy (Henry Fonda – Once Upon A Time In The West / Steve Martin – Novocaine / Robin Williams – Insomnia / Jim Carrey – The Number 23). In Mr. Brooks it’s Kevin Costner’s turn to switch from western moralist, baseball player, gilled ocean-man, or JFK truth-finder to that of a serial killer. Mr. Brooks is a successful businessman with a nice wife and daughter in college. He has a little secret, though. His alter ego (played by William Hurt) pops up at inopportune moments, pushing him to go out and kill. To Mr. Brooks it is an addiction which he has had under control for two years. But the urge pushes him for just one more. While carefully planned and executed as before, this particular fix had one crucial loose end which leads to a witness with photographic evidence confronting him. But this man is not interested in money or handing him over to the police – he wants to go along on his next kill! 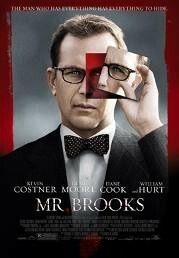 This throws a spanner in the works of Mr. Brooks’ attempts to quit for good – but to the elation of his alter ego. Naturally things will not go smoothly as this little game unfolds, especially with a determined cop on his trail (Demi Moore). A couple of sub-plots are also tied in very well, making the story more diverse. Sadly, CSI’s Marg Helgenberger merely plays the obligatory wife and could’ve been done by anyone. Mr. Brooks is a good departure for Costner however, and taps into how easily the line between true psychosis and desensitized urges can be blurred in a world where moral fiber is systematically eroded and bad behaviour is rewarded.